I’ve realized, in looking at my schedule for the summer, that because of the Unlikely Dance series I have very few new small pieces to show. And getting so mentally tangled up in Unlikely Dance is not really good for either the work or me. So I’ve started two small (20 x 16 in.) landscapes, and am working them in around Entry Hall. 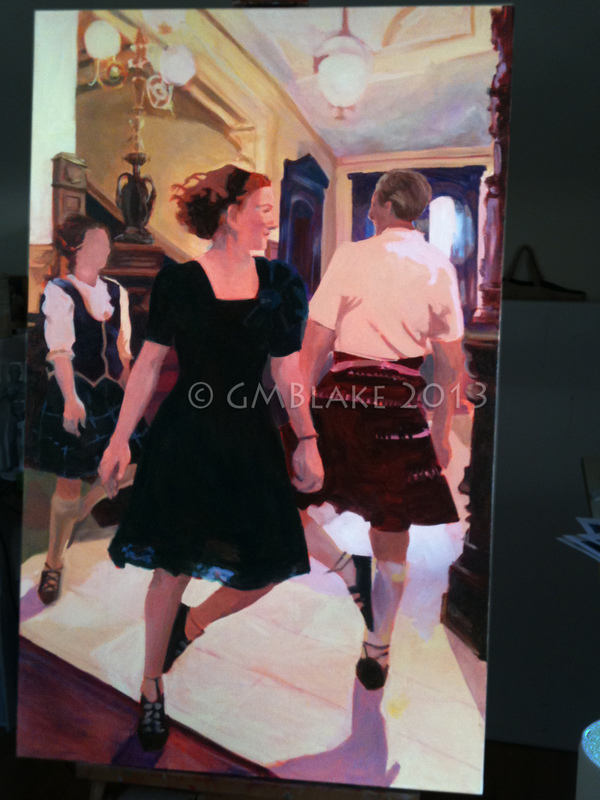 It’s proven great for the large piece — taking a couple of days’ break from it gave me a new outlook, and I made a lot of progress when I got back into it. And I’ve found a new model reference for face #1 (L-R), which just wasn’t working. I’m just waiting for the overpainting to dry. I think two or three more work sessions should see it finished. During drying times I’ve gotten both small landscapes underpainted, and am nearly finished blocking in first colors on the first one, River Willows. 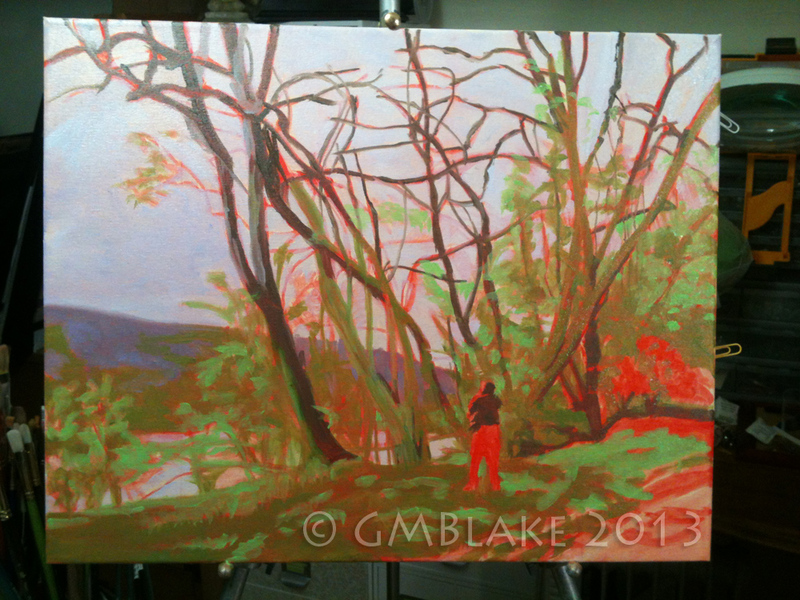 It’s referenced from a series of photos I took last spring, along the Susquehanna River around Endicott, NY. I also have a new taboret and palette! My husband is doing a complete renovation of our kitchen (his wonderful food and cooking blog is Dinner at Leo’s), and he no longer needs either the small pantry drawer unit or the wire kitchen cart so I’ve taken them over, and added a 12 x 18 in. cheap metal picture frame on the top for a palette. The glass in the frame makes the easily-cleaned palette, and I put light grey paper under the glass for a neutral colored mixing surface. The wheeled cart is so much easier than the previous small shelf unit to move from one painting to another. Very pleased! 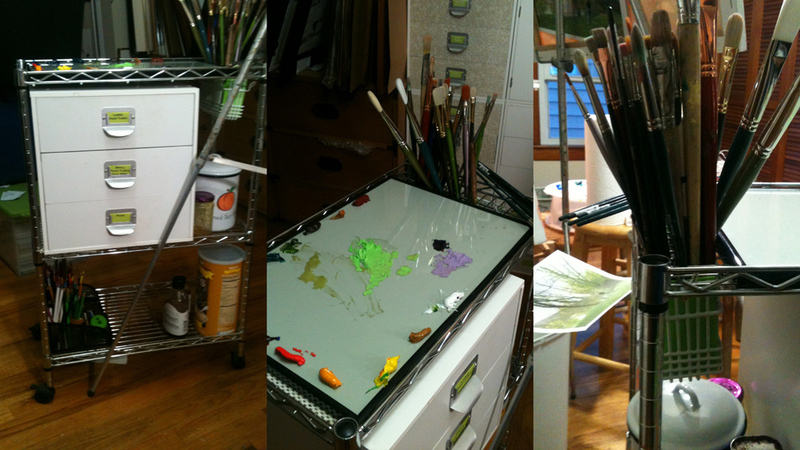 My new taboret and palette: the diagonal rod across the drawer unit is the leg of my folding easel.